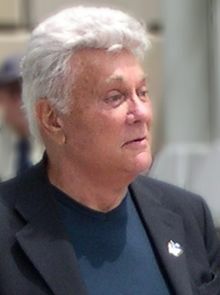 Tony Curtis (born Bernard Schwartz; June 3, 1925 – September 29, 2010) was an American movie actor. He was most popular during the late 1950s and early 1960s. He is famous for his light comic roles, especially his musician escaping from gangsters in Some Like It Hot (1959). He has also acted in more serious and dramatic movies, like The Defiant Ones (1958), for which he received an Academy Award nomination. He has appeared in over 100 movies since 1949, and made frequent television appearances. He was the father of actresses Jamie Lee Curtis and Kelly Curtis. Curtis was born in The Bronx, New York. His birth name is Bernard Schwatz. He is one of three sons of Helen (nee Klein) and Emanuel Schwartz. His parents were Hungarian Jewish immigrants from Mátészalka, Hungary. Hungarian was Curtis's only language until he was five or six, postponing his schooling. His father was a tailor and the family lived in the back of the shop—his parents in one corner and Curtis and his brothers Julius and Robert in another. His mother once made an appearance as a participant on the television show You Bet Your Life, hosted by Groucho Marx. Curtis said, "When I was a child, Mom beat me up and was very aggressive and antagonistic." His mother was later diagnosed with schizophrenia. His brother Robert was also institutionalized with the same mental illness. He died on September 29, 2010, aged 85 of cardiac arrest in Henderson, Nevada. ↑ "Tony Curtis biography". biography.com. A&E Television Networks. Retrieved 9 January 2014. ↑ "Curtis, Tony 1925–". Contemporary Theatre, Film and Television. encyclopedia.com. Retrieved 9 January 2014. ↑ "You Bet Your Life 0". YouTube. Retrieved 2014-01-09.